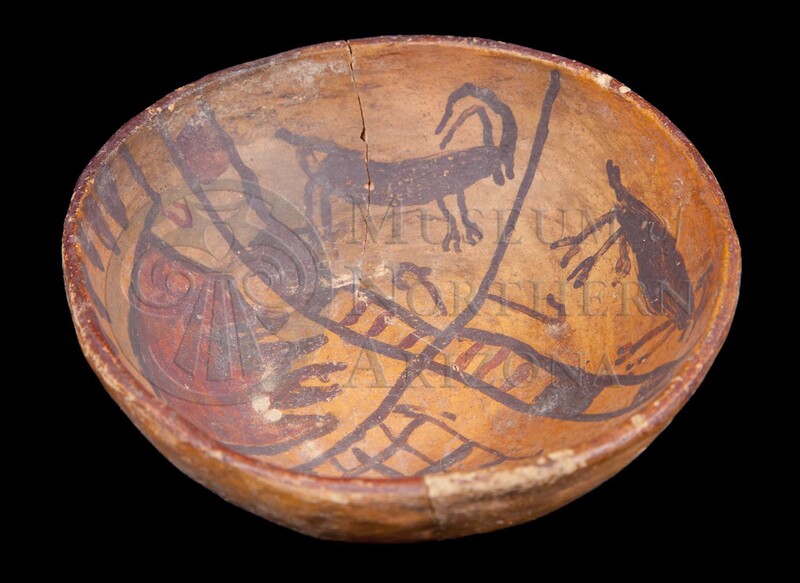 Payupki Polychrome bowl from the Museum of Northern Arizona collections. Click the image to open the Polacca Yellow Ware gallery. Polacco Yellow Ware is a historic Hopi pottery ware that grew out of the preceding Jeddito Yellow Ware series. A defining attribute of Polacca Yellow Ware is the elimination of overtly religious Native motifs, the introduction of Spanish motifs, and an increase in covertly Native religious imagery, the most common of which were feathers. Types included in the American Southwest Virtual Museum include: Payupki Polychrome and San Bernardo Polychrome. Core Color: Range of yellows, oranges, and pinks; fire clouds common. Temper: Temperless, or small quantities of clay fragments, iron manganese nodules, fine quartz sand, and/or red angular fragments. Surface Finish: May have a thin wash or slip; smooth to polished. Surface Color: Orange, yellow, and cream. Paint: Pale red, red, or dark red and black (matte). Design: Rims painted red or dark red, and bases often red-slipped. Spanish motifs common, except for on Payupki Variety A.
Copeland, Kathryn E. (2012) Payupki Polychrome and Ethnogenesis in Post-Pueblo Revolt Hopi Society. Master’s Thesis, Department of Anthropology, Northern Arizona University, Flagstaff. April Peters and Meghann M. Vance, Northern Arizona University Anthropology Laboratories.